PROOFFLab is the laboratory of PROOFF, which stands for PROgressive OFFice, is an innovation platform for the development of ideas and special products for a communal, flexible work landscape. Directors Jurgen Bey and Rianne Makkink regularly select study subjects related to work, that form the basis for product development by our Studio Makkink & Bey team of designers. As a team, we theorize, outline and model design specials that fit into the domain of work. The development and design of our environment and products is closely interlaced with the structure of our changing society. In PROOFFLab, we try to come up with progressive spatial forms for changing workspaces. We explore new measures of the spatial organization of work, by constantly resizing the scope of our subjects. While working between the scales of product design, architecture and urban planning, zooming in and out gives us a detailed insight in the structures, links, subjects and objects that constitute work. Questions like these led us to expand on the idea of spaces within spaces, on sound in spaces, acoustic properties, elevations, social infrastructures, modularity, intersections of expertise, super light materials and structures, alternative means for transportation. With these subjects we perform thought experiments in speculative visuals in which we frame new ideas for PROOFFLab. To formulate new answers, we look at the office domain as a campus, a knowledge environment that is composed of communal indoor and outdoor spaces where learning, working and living fold into one. It’s cohesion gives the campus a great advantage for harvesting proficiency and ingenuity. As a follow up thought experiment, we compare office spaces to a library. As an infrastructure of knowledge, the library is perfectly modeled on the practice of the advancement of information and bring it into service. 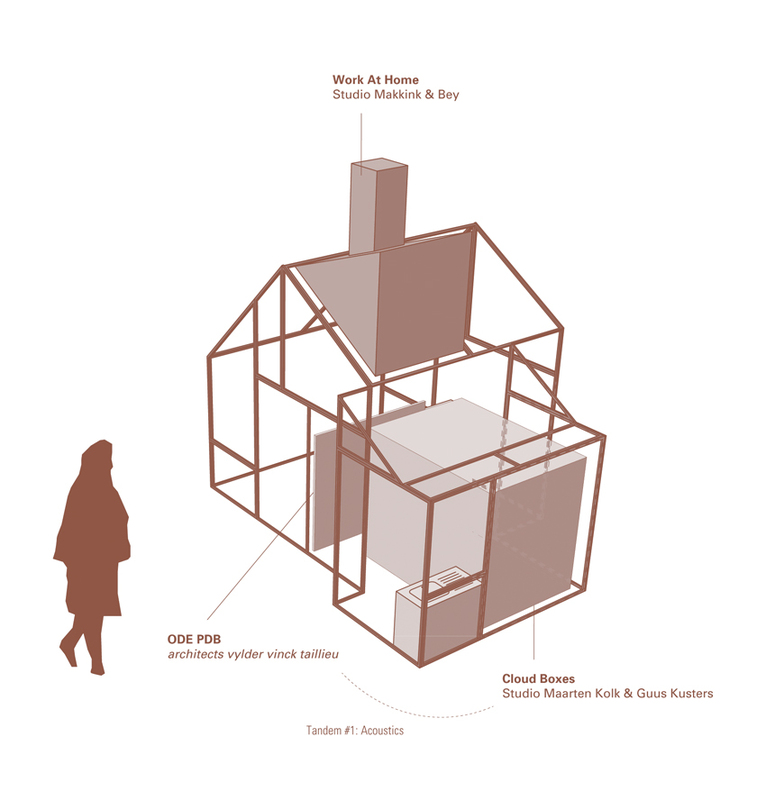 At the scale of one building, we imagine the office to be a house; a ‘PROOFFLab at Home’ that is a sum of parts. On this level we zoom in on architectural elements like the entrance, the walls, passages, the floor, the roof, building utilities, energy, use of resources and properties such as light, acoustics and temperature. All of these subjects are possible starting points to construct new subspecies of architecture to build with. It has become more than apparent that we need to live within our means. Studio Makkink & Bey tries to make effective use of resources, transport and avoid an oversupply of products by making prefabricated modular designs, that are available in different materials on request. Our ‘PROOFFLab at Home’ specials showcase parts of a building that can be inserted into, or placed onto an existing building structure. This week in Milan, that building structure will be the PROOFHouse, which, functioning as a showroom, contains the projects ODE PDB by architects vylder vinck taillieu, Cloud Boxes by Studio Maarten Kolk & Guus Kusters, which are the results of PROOFFLab’s first ‘tandem’, reflecting on the notion of acoustics. Also in the PROOFFHouse: Work At Home of PROOFFLab’s directors Studio Makkink & Bey.